Days before my long, long, LONG holiday staycation, I planned on writing everyday. I had all sorts of ideas and picture prompts but guess what? I wasn't able to do so. I was just so busy being a mom, a wife, and catching up on much needed sleep. My sons' girlfriends entrusted their dogs to my care because their families were going out on vacation. I didn't mind because I love dogs and would really want to have one of my own. So I had two dogs with me on a Visiting Forces Agreement. Haha. Fang has grown so big and since he is only six months old, he is still a puppy and is very frisky. He was jumping all over the furniture, running around the apartment like it was an open field. The wound he got when he was run over by a tricycle has fully healed however, the accident traumatized him so much that he freaks out when I take him outside for a walk. He freezes and quivers whenever a vehicle would pass by. I hope he gets over it. It really takes extra patience for me to take him out for his daily walks. Once inside the house, he is a sweetheart, and spends most of the time laying on the doormat - asleep. This is Fang, or "Fangaroochikoochikoo" as we fondly call him. And then there is Bite. Isn't it just weird, I have two dogs with me named Fang and Bite. Bite is a two year old Shih Tzu. He had his coat trimmed short. This way, we can avoid having fleas hiding in his long fur. He is a quite little one, looking at everyone with amazement. He is such a funny dog, trying to hide his treats under the fan and then whimpering when he cannot reach it. Bite loves walking outside, making friends with other neighborhood dogs. He is also housebroken (potty-trained) which is great. The moment I put on his leash, he knows it is time to pee and poop. That is Bite (R) and his friend Jester (L). Doggie Bromance at its best. This is Bite's first pictures, a few days after he arrived. 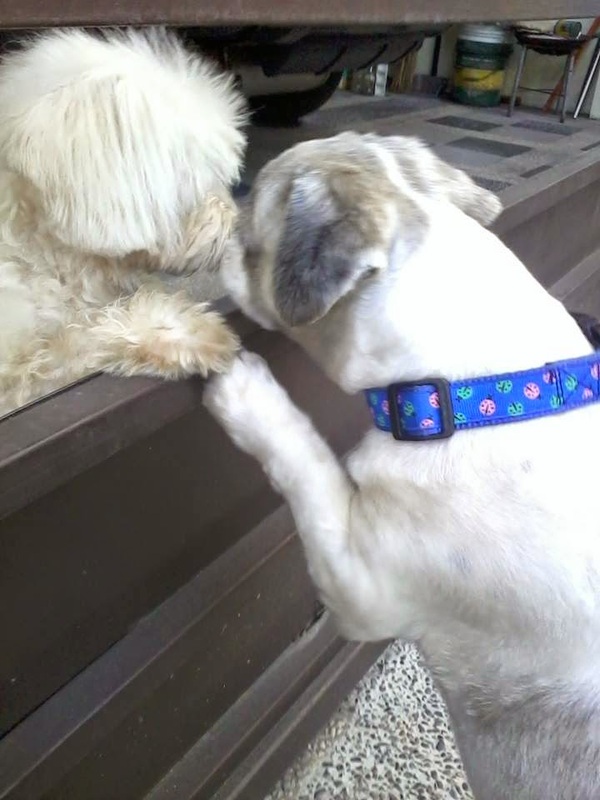 On the morning of December 31st, my son was approached by a middle aged woman asking my son to adopt her Shih Tzu. She said that she could not take care of it anymore. She gave my son her address (she lived only a block away from us). My son and my niece eagerly went to her house only to find out that the dog she was offering had so many issues. It was balding in some spots, her eyes were watery and she looked as if she was pregnant. My son was fearful that the dog had some disease that might infect Fang and Bite so they did not accept the woman's offer. Later in the day, while I was taking Bite for his walk, I found out that that lady tied a piece of rope around her dog's neck and left her in the Baranggay Hall (Village office). 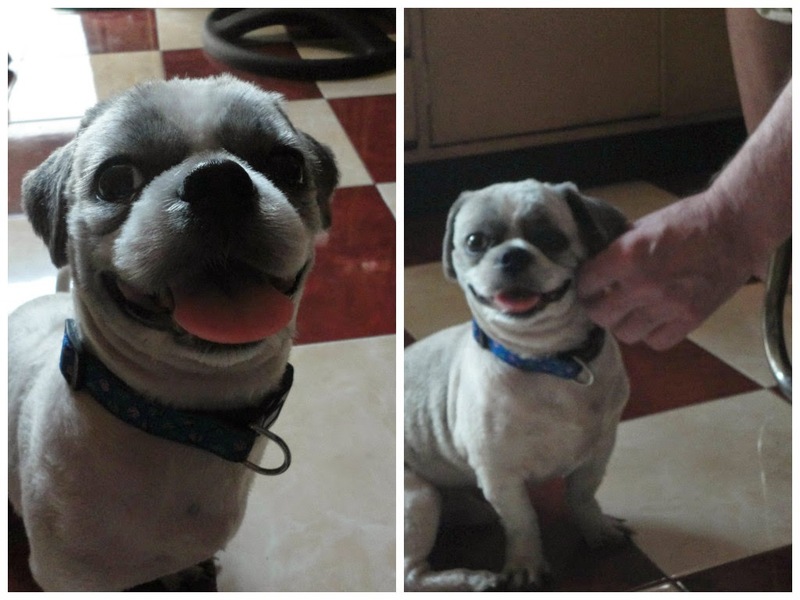 I took pictures of the poor dog, and gave her the name "Magdalena" (because she was "sawing palad" or "unfortunate"). I tried to take her to the pet clinic near our place to have her checked out but the clinic was closed for the holidays. The Philippine Animal Welfare Society (PAWS) office was also closed, and I felt so sorry for this dog. I uploaded the pictures on my Facebook page, asking friends if they would be interested to adopt Magdalena. Within a few hours, my friend Eien called and informed me she will pick up the dog and take her home to her Dad where she can be cared for. I was so happy that Magdalena will have a new family, and a new home on New Years' Eve. God Bless Eien's kind heart. This is Magdalena. 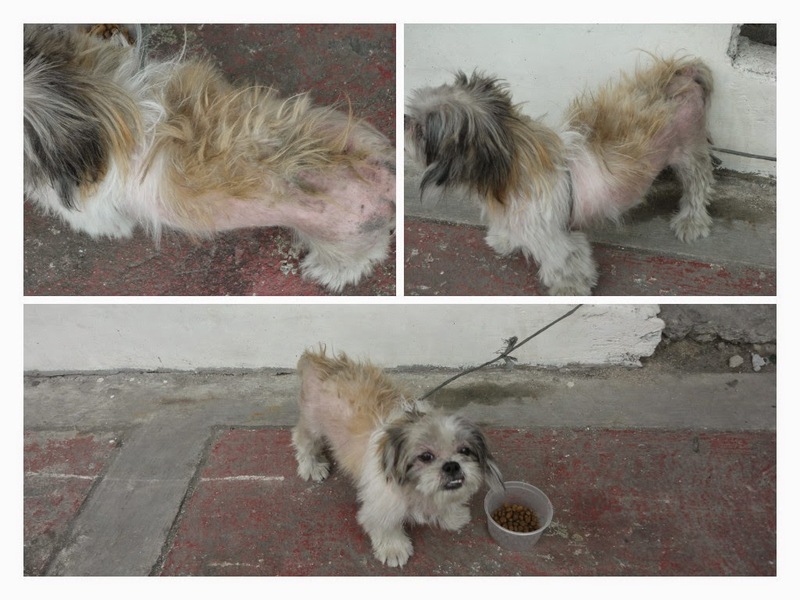 A Shih Tzu abandoned by her owner. I have not accomplished my yearly activity of feeding a homeless person at Christmas, but I felt I did something good to have an abandoned dog adopted. Animals are people too, and they deserve all the love and care from us. I hope I can do more good things this 2015. I have been blessed so many times and it is just right to give back and give forward. Another year, another chance. Peace. Hope. Love. May you all have a blessed New Year. What a wonderful deed that was done. Happy that the pup now has a family that can take care of it. Yes, Aimee. I was so thankful that Magdalena now has a new home. The first photo reminded me of my dog back home in Mama's home, he sleeps like that lol. Adopting a dog is a great way to take care of fur babies, we adopted our second one and we just love both of them. Hi Rose! I am also seriously thinking of going to PAWS (Philippine Animal Welfare Society) to check out the dogs they have for adoption. I have chosen one from their website, a two year old boxer mix. She's beautiful! You know what, I envy you because you're not afraid of dogs. We always have dogs in the house before I got married because my father loves dogs, but I'm so scared of them. Lol! I hope to overcome that fear soon. Hi Techa! Dogs are the most loving and most loyal pet anyone can ever have! I grew up having dogs in the house and it is just now that I can't have one of my own yet. wow! mga VIP naman ang guests mo. Anong breed si Fang. Pug ba? Hi Jennifer! I love happy dog stories too. I can spend hours on the internet looking at pictures of dogs and reading about them. My ultimate dream dog to have is an English Bull Mastiff. My second choice is a Rhodesian Ridgeback. Both expensive. Both high maintenance. Whew. I have to admit I will be totally at a loss as to how to take care of one dog, not to mention two. You certainly did a good job with these two. Hi Teresa! Oh these two are so clingy and cuddly! They love to be petted and hugged. Bite loves licking our fingers and toes while Fang stays at the foot of the bed when I'm asleep watching over me. I wish I could have them forever!